I’ve had a sample of this oolong tea that I purchased from Life in Teacup sitting in the tea cupboard for a while, waiting for a quiet night. Well that night finally came, and I have to say — this tea is incredible! It’s well-flavored and packs an intense aroma with the charcoal roast and succulent florals and fruits. To boot, it’s well-priced. 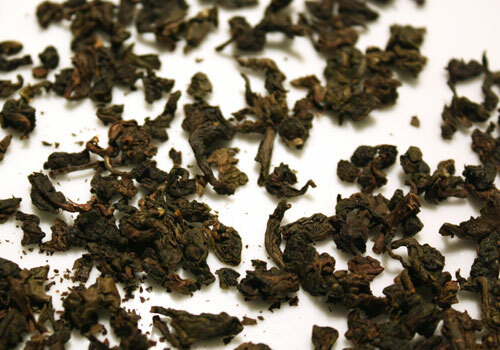 I’ve reviewed multiple oolong teas on the site so far, and this Tie Guan Yin has got to be one of the best. They also have a very detailed blog post about the history and story behind this particular tea. Time for each of the first 3 infusions (after warm-up): 20sec at 203 F. Increase the infusion time based on taste for later infusions. The leaves are dark brown from roasting, tightly compressed into small bundles of leaf and the sharp tip of stems. The roasting has imparted a nutty, toasted flavor to the dry leaves; they are very aromatic, and loaded with mouthwatering hints of peach and honey. In examining it, the perfume of the tea was heady and almost overwhelming. 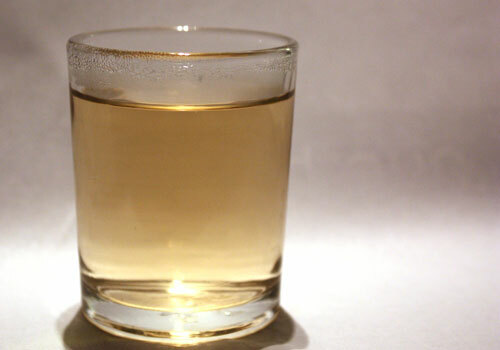 This tea showed great promise from the beginning! The liquor is a gleaming and brilliant gold. 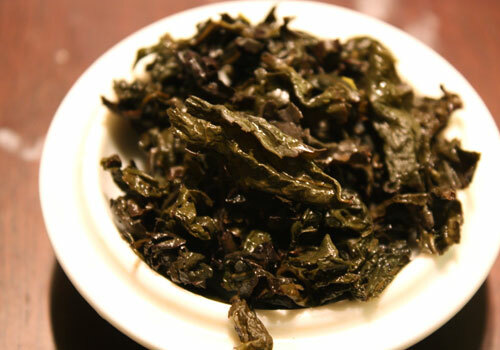 After steeping, the tea unfurls into large, full dark leaves. No doubts about it, this is a bold tea which packs a punch. I loved it! The impression at first sip is smokey taste with the strong flavor of toasted nuts that made my mouth pucker a little. It fades quickly from that peak, however, and the florals begin to emerge — peach and honey — with a very pleasantly sweet and lingering finish. It expresses the full dimension of the tea, and I love how many layers of complexity there is to the taste. This is like the fine cabernet sauvignon of teas. This tea lasted through several infusions. As I write this, I’m on #5 and the flavor is still going quite strong with a longer steep time. Overall, a wonderful tea. I’d highly recommend it. If you try this tea, make sure you take the time and give it the attention it deserves. There’s a lot of wonderful complexity to the flavor profile. You can purchase this tea from Life in Teacup’s website at $3.40 for 1 oz.